I know little of the Bronte sisters, so I can judge the book merely on its writing and characterisation, and Denton excells in both of them. I lived with the sisters on every page, moved by their spirit and touched by the tragedy. The sisters came to life in a manner that I never questioned historical accuracy or wondered about artistic licence. For me this was the story, delivately written with wonderful descriptive prose, attention to detail and a love for the genre. While I feared the Bronte sisters might be a bit ‘too girlie’ a subject for me, I needn’t have worried. The depth and gravity of Anne Bronte comes across perfectly, making for an extremely satisgying read. Without the Veil Between catches both the triumph and the tragedy of Anne’s short but quietly courageous and determined life. This book gives us Anne. Not Anne, the ‘less gifted’ sister of Charlotte and Emily, nor the Anne who ‘also wrote two novels’, but Anne herself, courageous, committed, daring and fiercely individual: a writer of remarkable insight, prescience and moral courage whose work can still astonish us today. What Denton has achieved is a portrait placed in a time very different from the jangling present, but that resonates in a way that suspends years and centuries …. … meticulous, poetic, luminous, and powerful … I can’t think of anyone better suited to bring us into the world of the sensitive, creative, and quietly courageous Anne. Tell us about the concepts behind your books, where the idea for them came from. As far as A House Near Luccoli, it was quite by chance, on the way to work one morning while listening to Canadian radio’s CBC 2, that I became aware of the 17th century composer Alessandro Stradella: his triumphant and tragic story and for the first time, at least knowingly, his magnificent music. Stradella’s talent for creating misadventures as well as masterpieces got me thinking about the paradox of such genius. I knew I would have to find a way into his story to explore the contradictions of someone with great talent who achieves much only to sabotage his success. By the novel’s end, the fictional Anglo-Italian Donatella, on her way from Genoa to England, is clearly not leaving her relationship with Stradella behind. So To A Strange Somewhere Fled was born, in part out of my experience of living and working in the Abbey and village of Wroxton, England for sixteen years and the opportunity “to return” and explore its history further; and, also, my affinity with the journey of a woman whose heart has been awoken and then broken, and who has to keep the whys and wherefores secret. 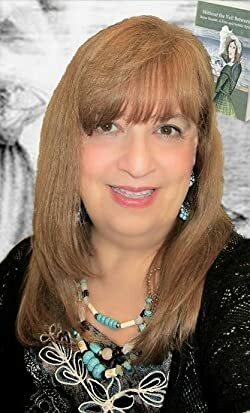 The Snow White Gift and The Library Next Door, my two kindle short stories, found their inspiration in my mother’s recollections of her childhood in 1930s Chicago. Generally, when I look for subject matter, I like to go down unchartered rather than well-worn paths, and focus on obscure historical characters, peel away their layers, writing about them in a “small” rather than epic way. With both historical and fictional characters, I always look for the ordinary in the extraordinary and visa-versa. What’s most important is that I challenge and even surprise myself in terms of where my future authorship takes me. Are you like any of the characters in your books, and, if so, what are the similarities? There are autobiographical aspects to the central female fictional protagonist, Donatella, in A House Near Luccoli and its sequel, To A Strange Somewhere Fled. Who better than myself to draw on as I went about characterizing an insecure, isolated, resigned if passionate and creative woman, who is well past her youth and, as it seems, more prepared to meet the mundane than the extraordinary? I readily admit she stepped out of my hopes and disappointments into an unlikely interaction with the colorfully confident Alessandro Stradella, his usual dalliances with women who were enticing and dangerous, the antithesis of Donatella … and me. The sequel, taking her to the very place in England where I lived 300 years later, only made her more of a creature of my experience, observations, secrets and revelations, perhaps, more honestly so, until—to rephrase a line from Wuthering Heights—she became more myself than I am. 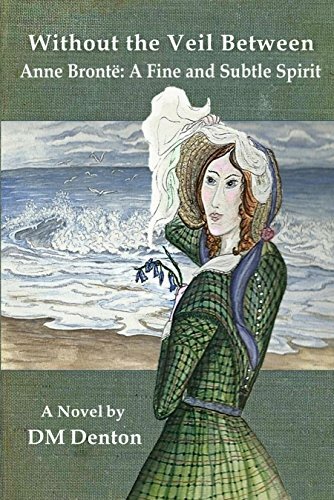 I’m writing a collection of novellas featuring three of my favorite and often overlooked classic women writers, Anne Brontë, Christina Rossetti—poet and sister of Pre-Raphaelite artist and poet Dante Gabriel Rossetti, and the early twentieth century novelist and poet Mary Webb. I have a couple of short stories brewing: one based on my maternal grandmother, who was a talented pianist and monologist and her thwarted chance to tour with the Ziegfeld follies, and the other based on my mother babysitting for Hemmingway’s sister Sonny. I’m also about to embark on an illustrated poetry/prose book about cats. Who would like to invite to dinner? Well, as I’m writing about them, Anne Brontë, Christina Rossetti, and Mary Webb, any or all of those three—before they had a chance to read what I had written about them, of course! I’m fascinated with Anne’s gentle strength and search for the truth, Christina’s Anglo-Italian temperament, something with I deal with myself, and Mary’s deep love of nature and animals. But, perhaps my first choice for a dinner companion would be my own maternal grandmother, a vibrant creative woman who died when my mother was ten. Even without ever physically meeting her, her presence has been strong and inspirational for me. My favorites are, for the most part, classic writers including the Brontës, George Eliot, Thomas Hardy, Gustave Flaubert, Emile Zola, Nathaniel Hawthorn, Henry James, Edith Wharton, Mary Webb, DH Lawrence, H.E. Bates, Colette, and Jean Rhys. As far as any more contemporary writers, specifically in the Historical Fiction category, I would say Tracy Chevalier—Girl With a Pearl Earring really inspired me to write my novel A House Near Luccoli—and, also like Chevalier, because of their very sensory and lyrical focus on artists and musicians, Susan Vreeland, Susanne Dunlap, Stephanie Cowell, and Laurel Corona. How have you found the experience of publishing? What have been the highs and lows? The lowest low regarding being published was when I thought I never would be, especially once I had finished A House Near Luccoli, was very proud of it, excited and, more than I had ever been with anything I’d written before it, determined to share it with others. I was considering self-publishing when serendipity directed me to a small publisher All Things That Matter Press—the day of signing my first contract with them was such a high point. 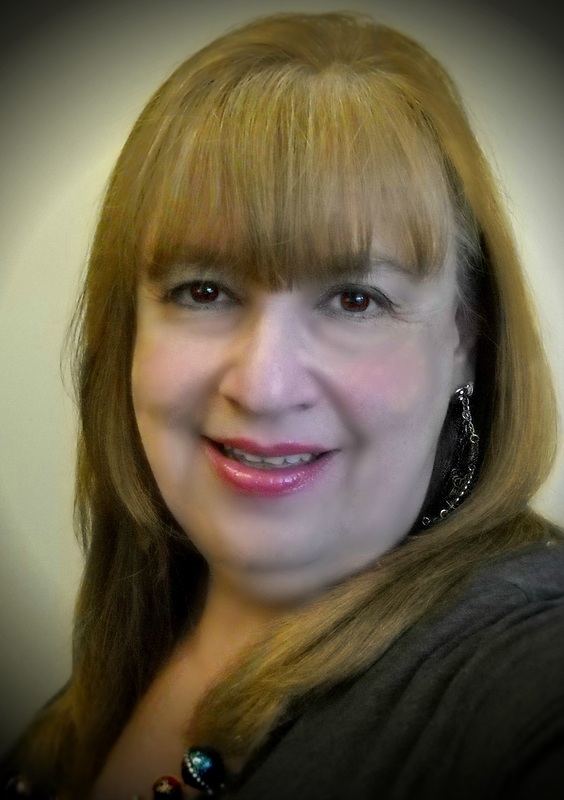 The process of publishing two novels with ATTMP has been a thoroughly positive experience, especially working with Deb Harris, one of the owners of the press and a wonderful editor who knows how to get the best out of my writing, how to refine and clarify it. Of course, getting published is just the beginning of the rollercoaster ride of being an author. Building a readership offers many despairing days, but somehow never totally without a thought, a pause, in gratefulness for those who have ventured outside the main stream to find and read my work, which gives me the will to keep going. Perhaps the most satisfying high of all comes at the end of a good writing session. What do you like best about writing? What do you like least? I find such pleasure in words, their shape and sound; how they hold back and reveal and sometimes play tricks; how they accumulate, some seeming insignificant, others essential, but all necessary as out of the chaos of my thoughts and feelings they compose themselves to tell stories, pretend and reveal truths, amuse, engage the intellect, stir hearts, and reach out of and into souls. Writing has seen me through so much of my life, feeding my imagination and fulfilling my need to create. It’s always there with its unlimited possibilities, which encourage mine. There is hardly an hour that goes by that I don’t think about it, an obsession I perceive as a blessing in my life. Is there anything I don’t like about writing? A few years ago I might have said marketing; like many newly published authors, at first it scared me to death. But, increasingly, I have accepted the challenge and even enjoyed it as it has become a creative exercise in itself. I don’t mind editing, on my own and working with a third party, because anything that brings all the months, even years, of hard work to the best conclusion is worth it and rewarding. The only thing I can think of that I really don’t like is the stress of wondering if something was missed in the editing, dreading coming across an error, however small, once the work is published. I’m also an artist—if more by accident than I’m a writer—and have done artwork for the covers of both my novels, grateful that my publisher has allowed me to contribute to their look. I’ve also done the cover of Dancing in the Rain, an excellent collection of poems by Yorkshire poet Christine Moran, as well as the illustrations of my kindle short stories. My blog has, over the past four years, featured much of my artwork along with poems and short prose pieces. I have self-published an illustrated poetry book, A Friendship with Flowers, that was originally a journal I did when I lived in England, about flowers throughout the year. What song would you pick to go with your books? Vincent/Starry, Starry Night by Don McLean, a song reflecting on the creative spirit who is an outsider and true individual, someone isolated and at the same time complete, fragile and yet enduring. 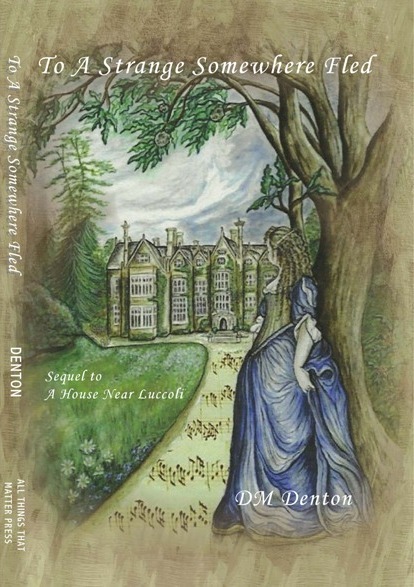 DM Denton’s third novel, “Without the Veil Between, Anne Brontë: A Fine and Subtle Spirit”, about Anne Brontë, the youngest sister of Charlotte and Emily, was published November 2017 and contains her original illustrations. It is available in print and for Kindle. DM Denton’s first and second novels, “A House Near Luccoli”, about an unexpected intimacy with the legendary if now rather obscure 17th century Italian composer Alessandro Stradella, and its sequel, “To A Strange Somewhere Fled”, set in late Restoration England, were also published by All Things That Matter Press, and are available in Paperback, for Kindle and as Audio Books. Her two Kindle short stories and an illustrated flower book, A Friendship with Flowers, are also available. Her educational journey took her to a dream-fulfilling semester at Wroxton College, Oxfordshire, England, and she stayed in the UK for sixteen years–in a yellow-stoned village with thatched cottages, duck pond, and twelfth century church and abbey turned Jacobean manor house. She lived, for better or worse, right off the pages of Fielding, the Brontës, Austin, Hardy, DH Lawrence, and even Dickens, surrounded by the beautiful hills, woods and fields of the Oxfordshire countryside, and all kinds of colorful characters. This truly turned out to be a life-changing experience that resonates in her personal and professional endeavors to this day. Great interview and all of the author’s works sound fascinating. I love the Bronte sisters although Anne is the one I know the least about, so I’ll go and check her new novel out. Thanks! Christoph, this post sparkles! I enjoyed hearing about the book and the interview too. Best to DM. Hugs all around. Wow. If it’s not too girly for you, it’s definitely not too girly for me! Sold! Just put this on my wait list at the library. Nice interview. Thanks for the recommendation. Great interview and review. Sounds like a good read. Thanks Mary Anne and Happy New Year! Great interview, and thanks for the recommendation! I owe you a big thank you, but, also, an apology, Christoph, as somehow I missed this post regarding my new novel. My mom was in the hospital and then rehab for six weeks around the time the novel came out and, although I tried to keep up with everything online, I missed some things and feel especially bad having to do belated thank yous. I want you to know how extremely grateful I am for all your support of my writing and your generosity of spirit that inspires and encourages other writers. Not least, I am humbled by your praise as you are such a fine author yourself. All the best for 2018 and far, far beyond, my friend.